I have many bars in my stock that await being reviewed. But the one I have on the table here I anticipated the most. Mike&Becky gave me several bars at the end of January, yet they just had been manufactured. Clearly the bars needed to mature for a couple of weeks to obtain their optimal flavor profile. And today they are finally ready. Mike&Becky as a brand is quiet new to the bean to bar scene. Based in Brussels, they create their chocolate in a wonderful little workshop, which is also a chocolate bar and meeting point. You can hop in to get a cup of hot cocoa, buy a chocolate bar made by themselves or one of their fellow bean to bar chocolate makers, or see them produce the chocolate in their workshop. Located in the back of the shop, it is one of the rare places in Belgium where you can actually see how the dark gold is created. Going there is person means you’ll meet Björn Becker and his wonderful wife Julia Mikerova. Doesn’t sound to Belgian, right? Björn has a German origin, while Julia is a prime example of the Russian origin. As a couple they landed in Brussels in the diplomatic world, yet also ventured into the world of fine chocolate. Starting with their webshop www.bean2bar2you.be, they soon moved over to making the product themselves. They have a great sense of humor and are always available to tell you more about the fascinating world of fine chocolate. As I have to start somewhere, I randomly picked this bar out of the collection I received. A 70% Peru bar made from cocoa grown near the Marañón river in Peru. This Nacional cocoa is renowned for its delicate flavor profile shining bright in the hands of a skillful chocolate maker. Peru is quickly becoming one of my favorite origins as different chocolate makers already dazzled me with bars showcasing splendid and aromatic sensations. Are Mike&Becky adding one more bar to this list? Even though Mike&Becky as a brand is fairly new to the scene, it is clear they left nothing to chance before releasing their chocolate bars. The product is packed in a rigid cardboard wrapper with a very nice envelop style design. You can open en close the box very easily. The outside is decorated in bright grapefruit pink with clear imprint showing the brand, origin and percentage of the bar. The entire wrapper is printed on every possible side, giving info on the fish at the front (Chocolate Rhino Pleco, a catfish species living in the Marañón river), the ingredient list, an introduction on bean-to-bar en Mike&Becky, an overview of the entire chocolate making process in drawings and finally some tips on how to properly taste chocolate. Impressive! But the star is the chocolate bar itself. 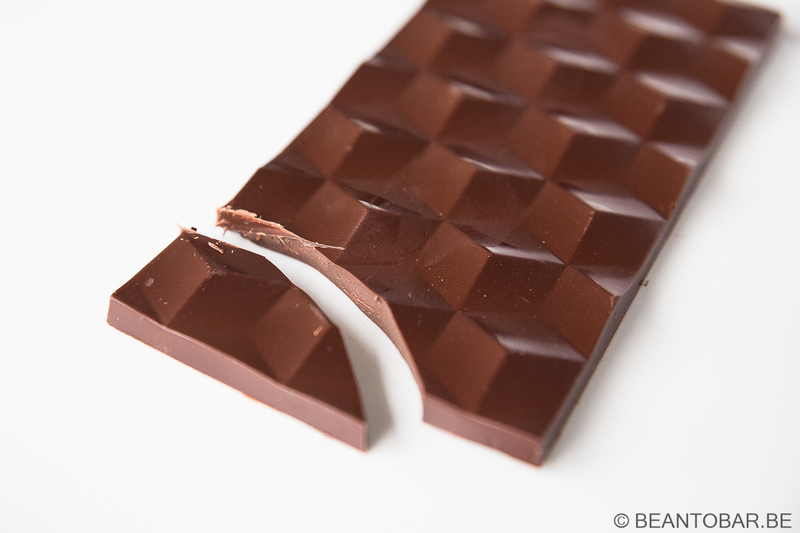 As the Belgian painter René Magritte would claim: Ceci n’est pas une barre de chocolat! It is a work of art! I have not encountered this mold before. It has relief offering a staggering three dimensional feel, no matter how you look at it. Turn it around so the light hits it from different angles and it seems to be made up of cubes, protruding from the bar. Even more impressive. Overall, everything about this bar screams premium. But good looks are just a plus. What about the flavor? Taste: Good snap on breaking of a piece of the bar. You immediately notice a butter smooth yet light, French style texture. The melt starts off with toasted bread and a hint of Italian espresso coffee – followed sweet by lush chocolate with a pinch of fruity acidity popping up left and right. For some reason it makes me think of pineapple. Flowing on, the aroma reveals some caramel and honey, before releasing and end aroma of roasted hazelnuts and coffee. The aftertaste follows the base notes of the main flavor, without the fruits. It remains endlessly lingering in the mouth, becoming a bit smoky and ethereal and adds to the enjoyment of experiencing the chocolate. Almost everything about this chocolate is spot on. The velvety texture, a smooth and rewarding flavor profile – light, yet aromatic and finally the rewarding after flavor. 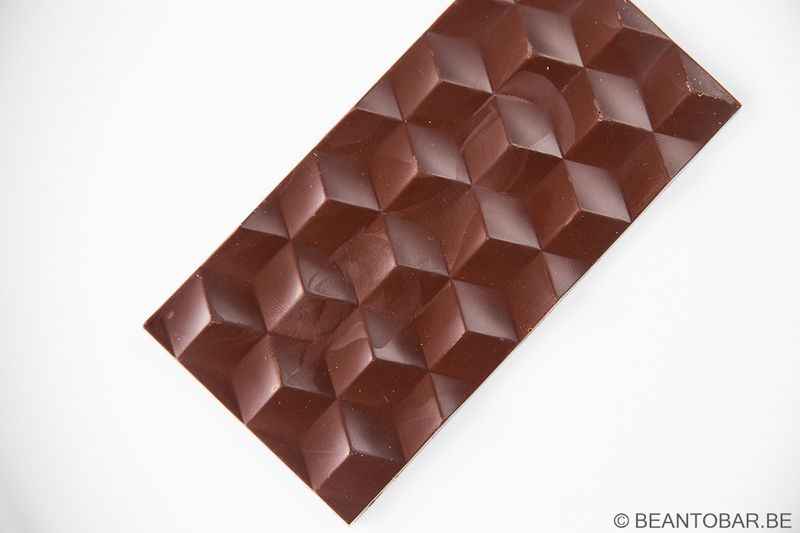 The more I taste chocolates, the more their flavor profile starts to remind me of colors. This particular bar has a distinct green/yellow feel to it. Mellow and sweet at heart, it has just the right amount of fruity and earthy counter notes to keep it light and playful. It meanders like a peaceful stream through a dense rain forest. The perfect companion early in the morning or during a lazy afternoon. 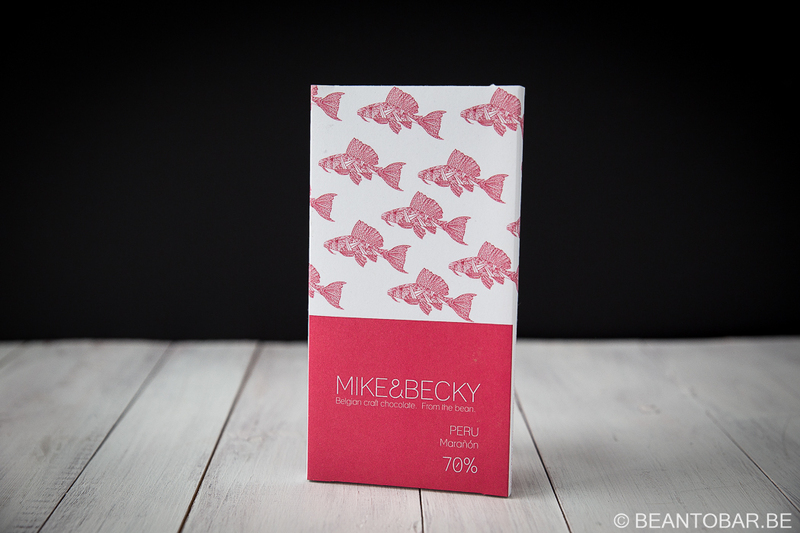 If Mike&Becky can keep up this quality throughout their product range, their star will shine bright in the bean-to-bar scene and Belgium can be proud of being home to yet another great chocolate maker (with a distinct international German-Russian accent to it). Well worth the try and don’t forget to visit their shop whenever you are in Brussels! Hi Kris, I’m Brian the cacao bean guy that provided the beans for Mike and Becky to make this bar, writing from Peru. I thought your review was very well written and I’m glad you liked the bar. i don’t know if you knew this, but the cacao pods here are green when unripe, then a beautiful golden yellow color when ripe. So your color comparison was amazingly accurate! Keep up the great writing.